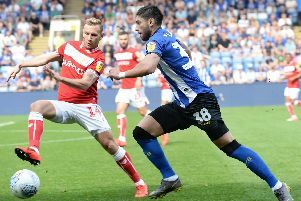 Sheffield Wednesday host Middlesbrough tonight in the Championship as Jos Luhukay and Tony Pulis’ side do battle for a vital three points at the top of the table. The Owls, who sit in sixth place, could draw level with Boro if they win at Hillsborough while the visitors could move to the top of the table if they take all three points. Wednesday will be without Marco Matias and Fernando Forestieri for the match due to injury but Steven Fletcher and Barry Bannan will be available after training normally during the international break. The match is too early for Joost van Aken or Sam Winnall (knee), despite the striker getting an outing in a development squad match earlier this week. Tony Pulis will wait on the fitness of his ten international players who were away during the break, with key man Martin Braithewaite only returning to club duty on Wednesday evening. Wednesday have not beaten Middlesbrough in their last five matches, with the last victory over the Teesside club coming in February 2015. The last time Boro came to Hillsborough, Ross Wallace put the Owls ahead before the visitors came from behind to take all three points thanks to goals from Jonny Howson and Ryan Shotton in Carlos Carvalhal’s last game as manager. Wednesday win 12/5, draw 21/10, Boro win 6/5. Martin Braithwaite – A first team regular for Tony Pulis this season and has provided three goals so far. The 27-year-old attacking midfielder is full of confidence after scoring on international duty for Denmark and brings a quick, direct and athletic style to the Boro squad and is their main source of creativity. Peter Bankes – has taken charge of eight Championship matches so far this season, issuing an impressive 48 yellow cards and two reds in that time.